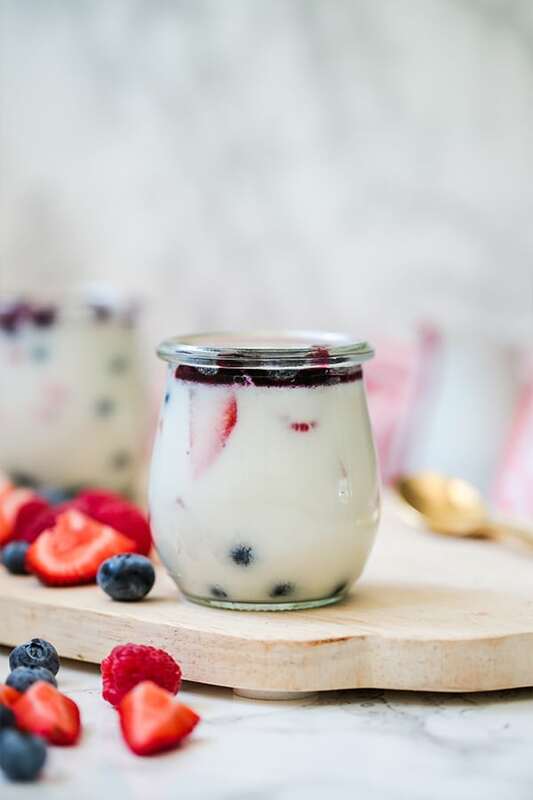 This Red White & Blue Berry Panna Cotta the perfect patriotic dessert! It’s simple to make with real food ingredients and is great for serving at your Fourth of July gathering. It’s dairy free, paleo, AIP and made without refined sugar. I will never get over my love for seasonal, holiday-themed foods. I firmly believe that food, in general, should be fun and enjoyable, but everyone joins in with me on that notion come the holidays! Of course, we’re used to October-December being the prime holiday food time, but there are lots of other opportunities for fun dishes sprinkled throughout the year. One of my favorites is the Fourth of July. Who doesn’t love a good backyard cookout followed by fireworks? 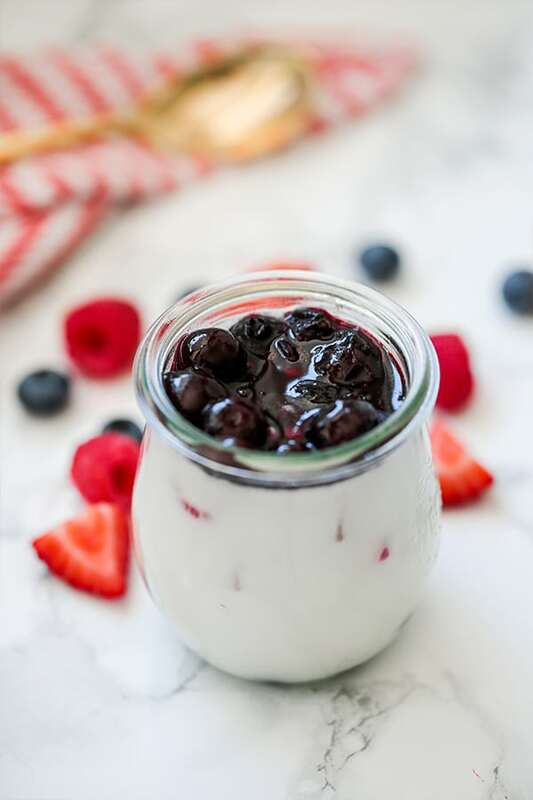 Plus, it’s prime time for so many fresh fruit desserts, like this Red White & Blue Berry Panna Cotta! So, what is a panna cotta? Basically, think of it as a pudding. It’s an Italian dessert that’s traditionally made with cream, molded into a glass dish, and very lightly flavored. It’s such an amazing allergen friendly dessert that takes minimal effort! 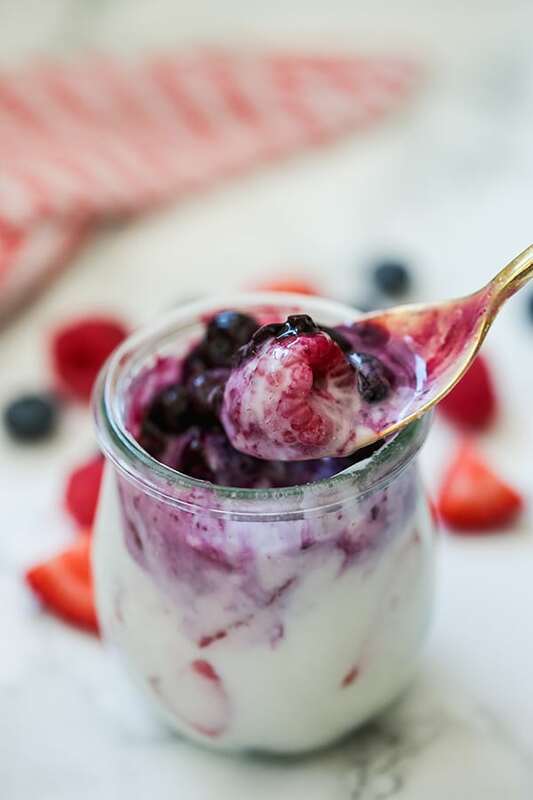 This panna cotta is made with coconut milk, fresh seasonal berries, natural sweetener, and is finished with an optional blueberry sauce to add even more color and flavor! I made this panna cotta recipe several times so I could test it and take photos and my husband and I loved it so much! I honestly had to make a conscious effort to save some for him and not hog it all for myself. It’s that good! Panna cotta traditionally uses cream, but this recipe uses coconut milk to keep it dairy free. You can use a homemade coconut milk or a coconut milk in a can that has no fillers. This is my favorite. Gelatin is what allows the panna cotta to form and harden. You cannot leave this ingredient out or substitute it with collagen or another ingredient.. this needs gelatin to work. This is where the red and blue colors come in! I used a mixture of bluberries, raspberries, and sliced strawberries. 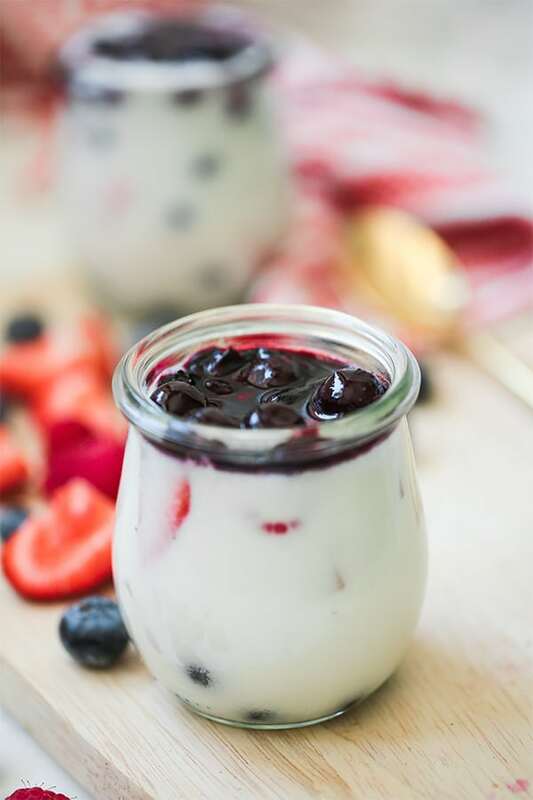 I used 7 oz Weck jars to store the panna cotta, and filled up about 3-4 jars with it. You can also use small glass ramekins or even short drinking glasses. Prepare 3-4 small jars or glasses (I used 3, 7 oz Weck Jars) and fill them about halfway with the mixed berries. Set aside. Using a medium-sized saucepan, whisk together the coconut milk, honey, and vanilla over medium heat for 5 minutes until well incorporated. Set aside. Using a small saucepan, pour in the water and sprinkle the gelatin over it. Allow sitting to harden for 2-3 minutes. Place the saucepan on a stove top and slowly melt the gelatin on low heat for 1-2 minutes, not allowing it to burn. Remove from the heat and vigorously whisk until the mixture is frothy. Pour the gelatin mixture into the coconut milk mixture and combine. Pour the combined mixture into the prepared fruit filled jars, and fill each jar evenly. Allow cooling on the countertop for 5 minutes until transferring to the fridge. Allow the panna cotta to harden in the fridge for 3-4 hours. Serve topped with optional blueberry sauce and enjoy! Add all of the ingredients to small saucepan and place on medium heat. Stir for 4-5 minutes, and don’t allow to boil. Allow to slightly cool. Serve over the panna cotta once the hardened. May I substitute Almond Milk instead of Coconut milk? I haven’t tried that, but I assume you should be able to. Let me know if you do! I know this is a stupid question but for how many serving is this recipe? ❤️??????????????????????????? ?